Handcrafted stalls from the PEMA family of carvers. Traditional and the unique Würzel (root) stalls. These are made from bark and roots found in the alpine meadows and each handcrafted to a unique shape and size. The photos here of Root Stalls are only examples. You should request a photo of the current ones in the carving shop if you want a particular look. Please note! 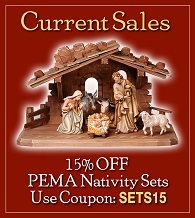 Stalls ordered with a nativity set ship for free; Stalls ordered alone are subject to a shipping surcharge (usually 10%) due to volume restrictions. We will contact you with exact costs prior to order confirmation.